A perfect back to school activity for the first week! 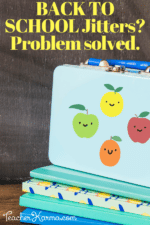 This FREE classroom scavenger hunt is a simple way to introduce students to all of your classroom supplies and doubles as a fun around the room brain break activity during the first week of school. Looking for a FREE activity for the first day(s) of school? Try this classroom scavenger hunt with your 2nd or 3rd grade kids. 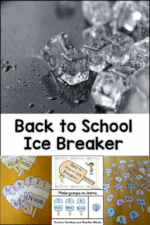 This editable back to school activity is an easy way to introduce your students to classroom supplies and learning areas, PLUS it counts as a much needed brain break on one of those crazy back to school afternoons! 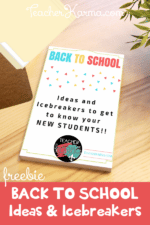 All you need to do is edit the free printable pages and add this idea to your FUN back to school activity pile for the beginning of the school year. Where are the tissues (this question is asked silently as a cute little eight year old stares at you while nastiness runs out his/her nostrils and close to his/her lip). How long does this back to school activity take to prepare? 20 minutes max! It’s easy to do. Just customize the editable freebie pages (these come in an editable PowerPoint for quick editing) with the items in your classroom, cut & tape the included numbers on the items around your classroom, makes copies, and then you’re ready to get-those-kidlets-a-hunting. Where can I download the free classroom scavenger hunt? 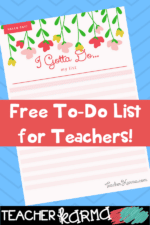 You can find the free download (which includes all the pages shown below) + detailed step by step instructions at the I Want to be a Super Teacher blog HERE. « Are You Looking For Something for Contractions?